Fear & Anxiety freezes us and stunts our growth. The resources provided help you in your endeavour to reduce and eliminate your fear dragons. First you learn to recognize your fears and anxieties, then you embrace them, and finally you let go of them completely. 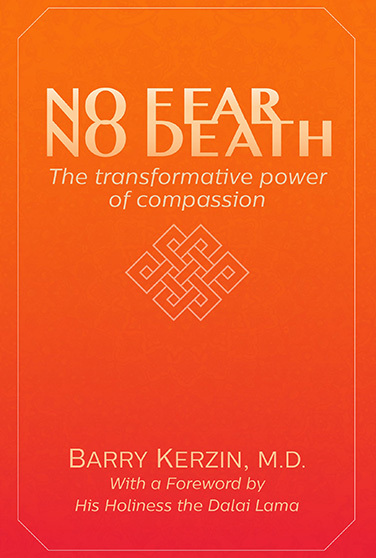 No Fear  No Death: The Transformative Power of Compassion brings together Dr. Kerzin's insights on the essential teachings for living a life of happiness, compassion, and service. This small book contains rich ideas and simple suggestions for living well along with profound insights on living and dying well. No Fear - No Death includes a Foreword by His Holiness the Dalai Lama. Fear & Anxiety can take our lives hostage if we let them. There are many aspects at the base of these debilitating emotions. This overview gives you an idea of what we can work on, and invites you to explore some of our other videos on the topic. Stay strong! Have you ever thought what role Fear plays for you? Fear doesn't come out of thin air, it fulfils a role. Get to the root of it, and begin to take the wind of fear's sails now. The earlier you begin, the better. 9 Round Breathing is very helpful for a quick calming effect when anxious and stressed out. It is a great practice first thing in the morning after getting up, or anytime you feel stressed, anxious or unbalanced. Giving in to just being can help us tremendously in calming down, to let go and relax. Just let it be. Enjoy! You might think: "Why accept and even embrace fear?" Maybe you are surprised to hear this, but accepting and embracing does not mean holding on forever, it is actually part of the process of ridding yourself of these crippling emotions. Watch to find out more. Dr. Kerzin talks about inner peace at CCare Stanford Medicine. During this podcast episode, we talk about the real you. Who are you really? Getting to the base of who you really are can help you in many aspects of your life, including tackling emotions of fear and anxiety. In this video you will learn about healing yourself and others through contemplative meditation. First starting with yourself, and then others. Healthy Self-Confidence has nothing to do with arrogance, it means neither putting down ourselves nor others.